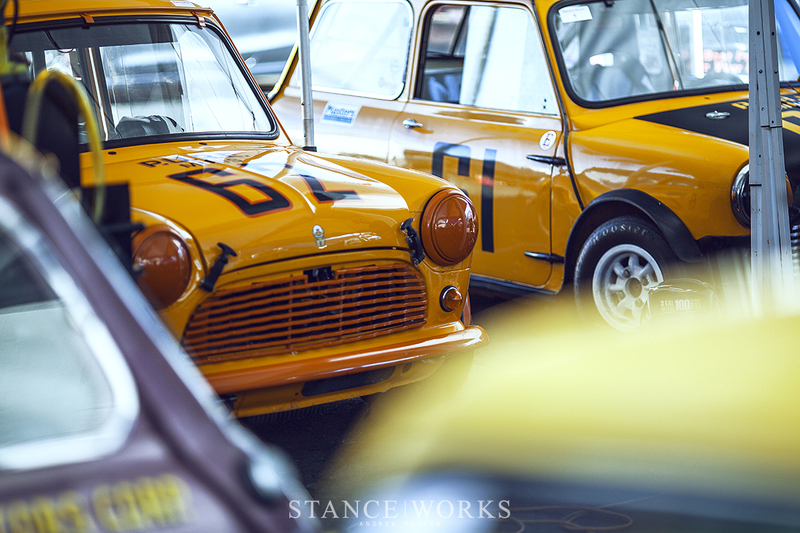 Though the Mini came to life under the guise of an affordable economy car, the influence of a few determined enthusiasts gave birth to what would become a long history of motorsport wins. The small stature, light weight, and revolutionary suspension came together to win races on long distance rallies and short circuit sprints alike. In a world of rear-wheel-drive sports cars and a realm where displacement often ruled, the Mini stood to buck trends and establish a name for itself. 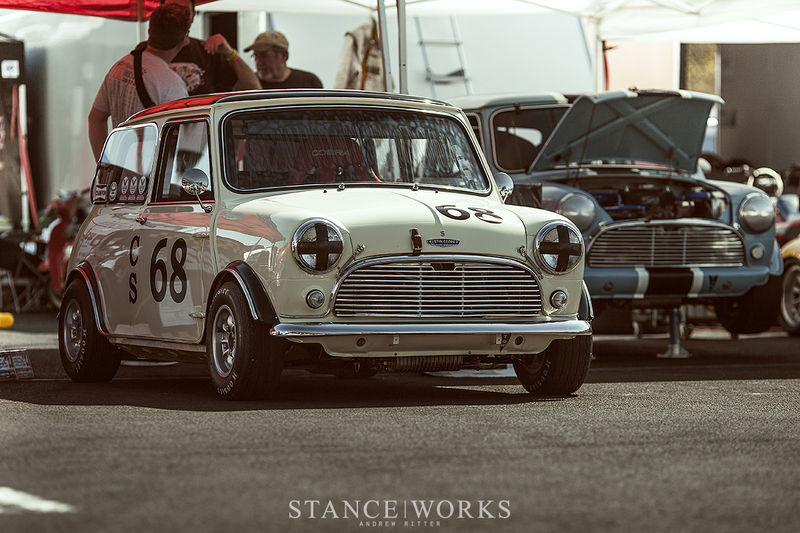 It's in the unique and humble nature of the Mini's motorsport efforts that I find inspiration for my own personal build as I continue to piece together the 1969 Morris Mini that resides in the StanceWorks garage. 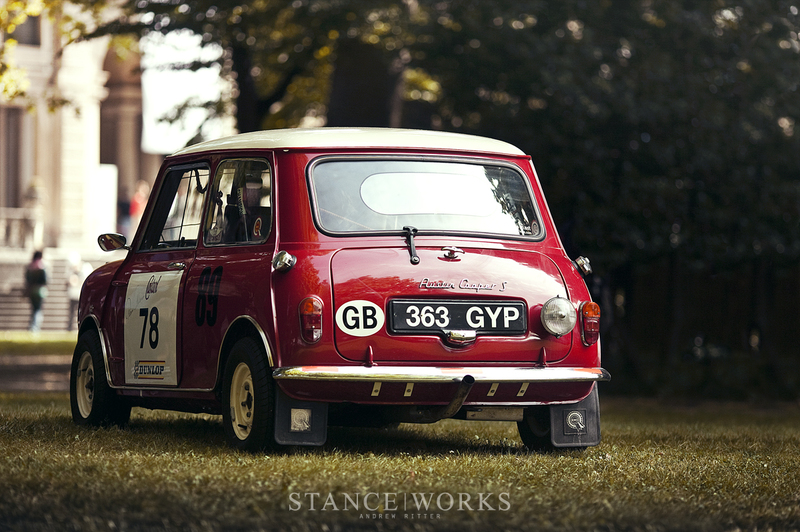 Under the now iconic red and white color way, the BMC Works team dominated the famous Monte Carlo rally for years, and gave rise to the Cooper and Cooper S models that transformed the Mini from a reasonable commuter to a sprightly competitor. Along with the John Cooper team, the BMC Works crew planted the foundation from which many racers found success behind the wheels of Minis, and their history fascinates me. I've begun to collect every piece of literature that documents their monumental efforts, poring over build sheets and scouring through old photos. 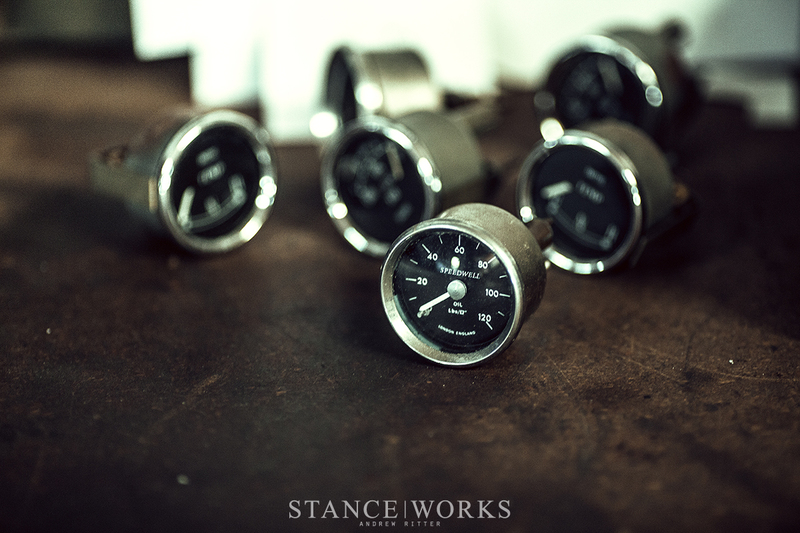 With a slew of ancillary gauges and switches to add to the otherwise spartan interior of my Mini, I flipped through my archives and began to plan out a dashboard reminiscent of the Works team dashes that accompanied many of the rally cars. 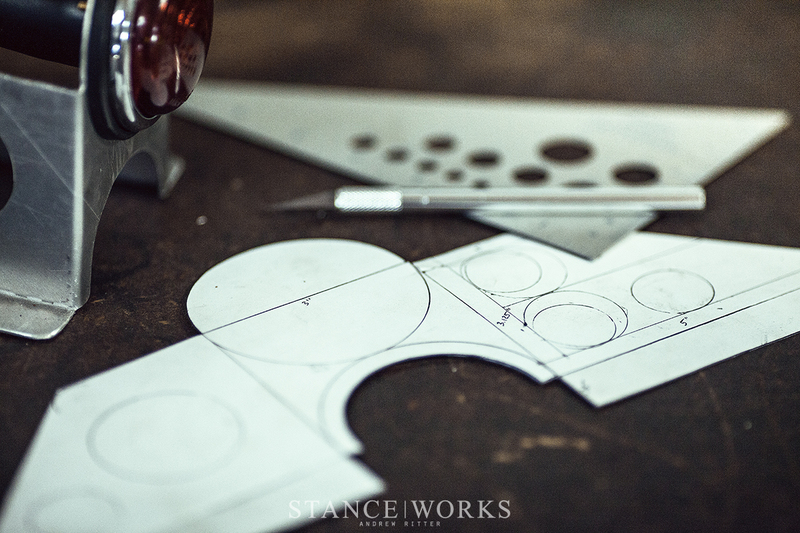 Armed with a razor and a straight edge, I began to form templates from scrap card stock. 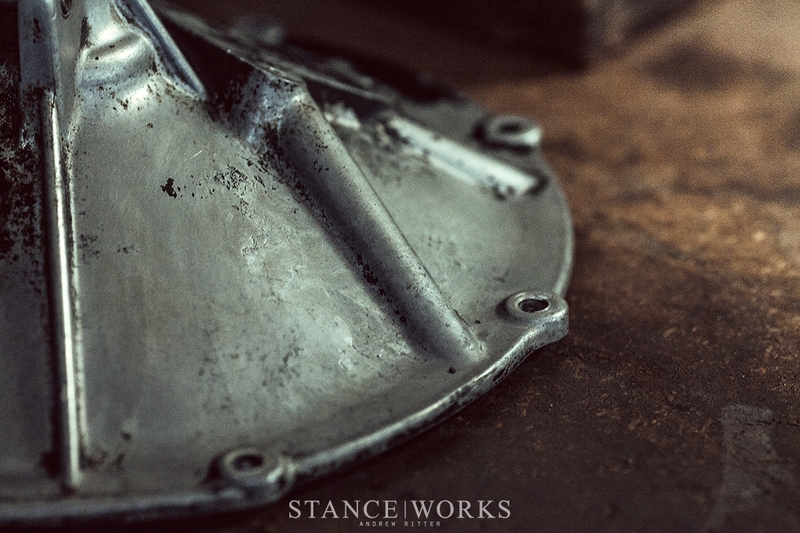 Between the front dash rails, I built up a pair of legs that would serve as a mounting structure for the front face plate of the dash box. In some of the old rally cars, the Works dash would protrude out, bringing rally light switches and windshield washing stalks within reach of the harness-strapped driver and navigator in times of need, but I kept my measurements down, tucking it close against the dash rails for a sleeker appearance. 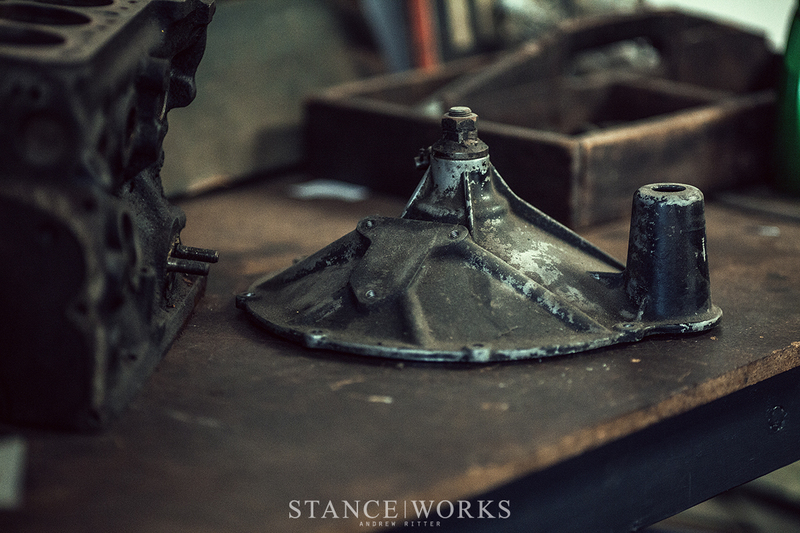 With a few slices and bends, the boxy faceplate had its shape, mounting over the legs that stretch back to mount against the firewall. At the same time, my marker was transferring an odd shape from a template to a sheet of aluminum that I picked up earlier in the day. With the Mini's low height and even smaller taillights, I've been tossing the idea of a third brake light around in my head for safety reasons. I knew that it would have to be a period correct solution if I was going to run one at all, refusing to resort to modern LED offerings that would stand out in an otherwise classic build. 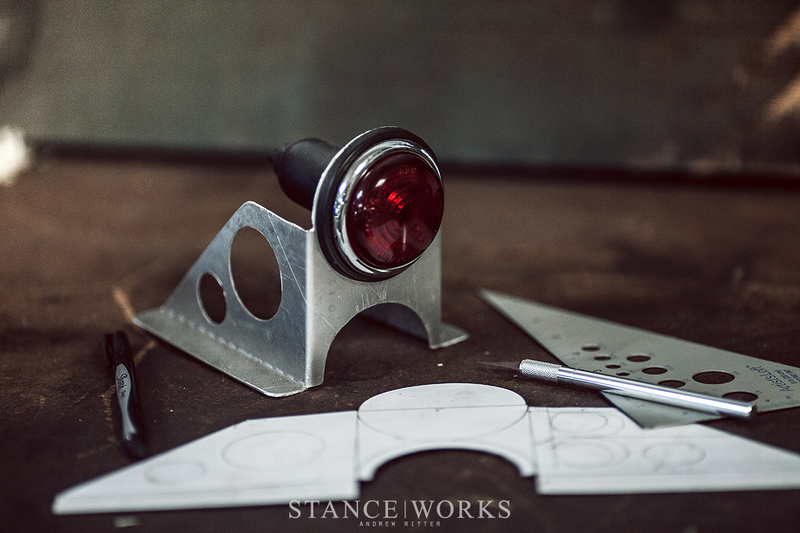 Taking design characteristics from other metal bits in the interior, such as the steering column mounts and pedal box, I came up with a simple design that feels as if it came from the work benches of the Mini race shop in Abingdon. 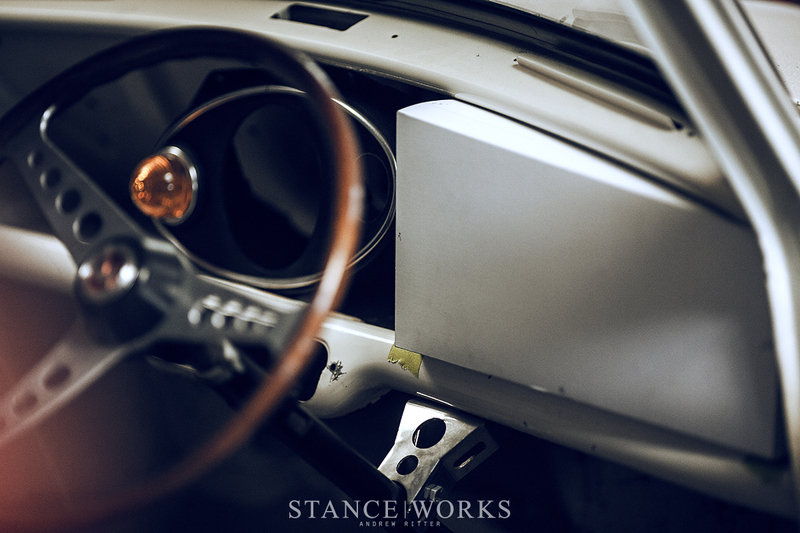 Utilizing a Lucas lamp, it will sit on the back parcel shelf and add a welcome bit of safety while in traffic. With the template design transferred to metal, I began cutting, bending, and punching holes until the cardboard shape had given way to a final product that I'm truly happy with. 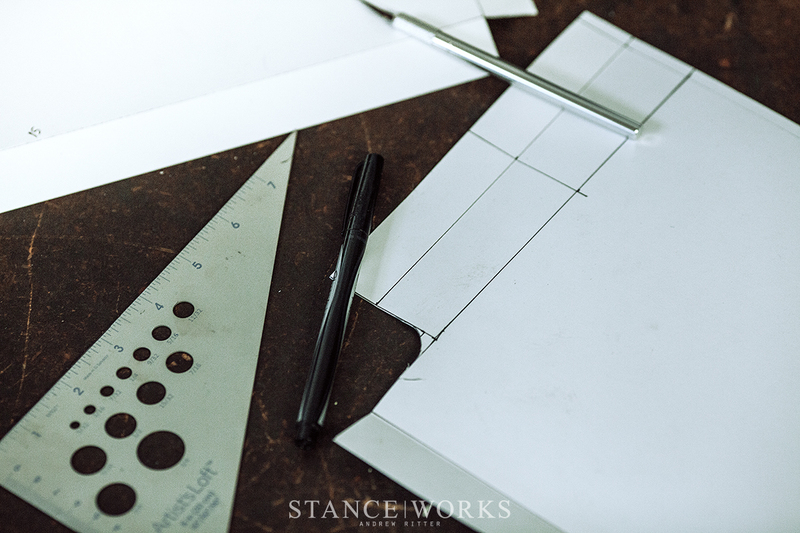 As the other parts come together, the whole batch will receive the final touch, a staple wrinkle finish that BMC used on their parts to cut down on interior glare. With my phone's alarm set to an early 5AM wakeup call, it could mean only one thing...it was time to to head to the airport. The trip was one that I've been waiting for for years. In 2014, I flew back to Ohio to attend the Can-Am Mini Challenge (click here to read more), and since then I've been itching to go again. 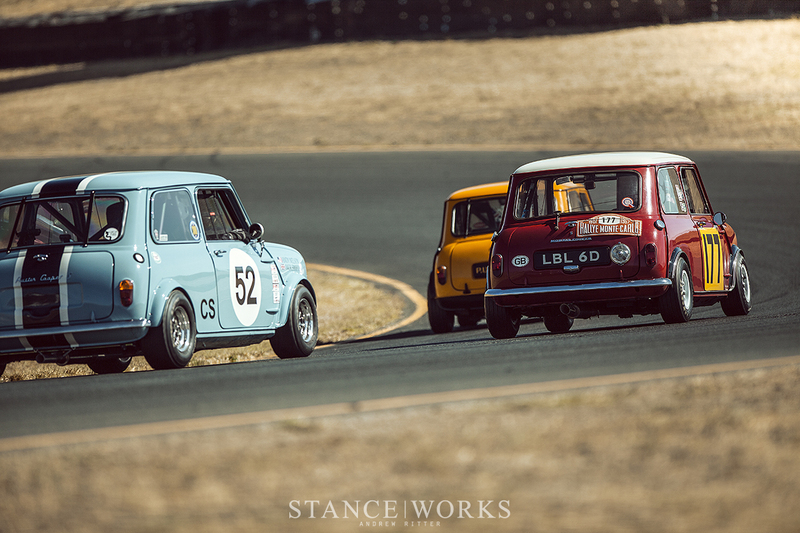 Fortunately for me, the organizing team decided to forego the previously intended 5-year intervals, and instead announced that Sonoma Raceway would host the next Can-Am Mini Challenge this year. So, without an ounce of hesitation, I was boarding my flight for San Francisco with my camera and an arsenal of lenses in tow. Before long, I was on the ground and headed for the initial practice laps of the weekend's motorsport festivities. All weekend, my heart filled with joy as the small Minis buzzed around the track, sliding around corners and fighting for their place on the podium. I spent hours wandering the paddocks in between sessions, pulling out my iPhone to snap quick reference photos for my own build. Roll cage mounting points, engine bay layouts, and race car details filled my phone's library with inspiration for later research and consideration. Saturday was almost a sensory overload as I rushed around to take it all in, but on Sunday it all came to a peak when I strapped in to ride along for a few hot laps in Mike Kearney's 1965 Austin Cooper S. The car has a long history racing in ARRC and with a similar color combination as my Morris, the car stood for everything that I had dreamed up for my own Mini. 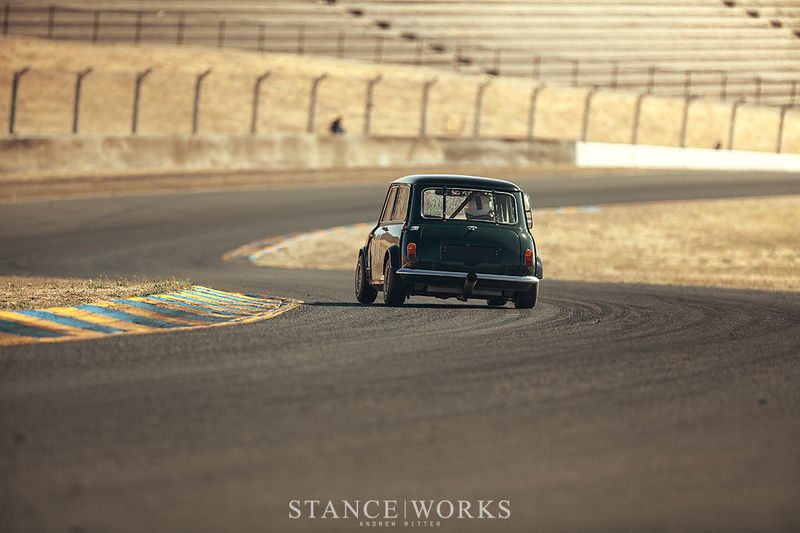 I was blown away as soon as the car sped out of the pits and clawed its way around the hills of Sonoma's race track. I've known the joy of driving around in Minis, but I had never been in one built with such purpose. As I took off my helmet and stepped out of the car, still buzzing with adrenaline, I was instilled with a renewed motivation to get my own car on the road. With excitement still coursing through my veins, I returned to the shop and instantly put the 1275 engine out and began cleaning it, hoping to keep the momentum running strong. With the engine apart, the next step was to get it cleaned up. Having spent years on the road and then years in a shed before making its way into my hands, it had accumulated an impressive amount of dust, dirt, and grime. I have an obsessive tendency that requires a clean working environment and detests working with dirty parts, so cleaning it all first was an absolute necessity. With all of the oils and fluids that are bound to coat a car's engine bay (especially those of a British persuasion), it can be hard to find the right cleaner to cut through it all, but fortunately Turtle Wax had just sent us a big bottle of their M.A.X.-Power All Purpose Cleaner, a spray that has varying strength to clean nearly any surface you'd find during car ownership. To cut through grease and fight off stains that decades of use had left, I went full force, spraying it directly on the dry surface for an undiluted cleaning. After giving it some time to work its magic and soak into the layers of grime, I was happy to find that the dark coating of grease wiped right off. 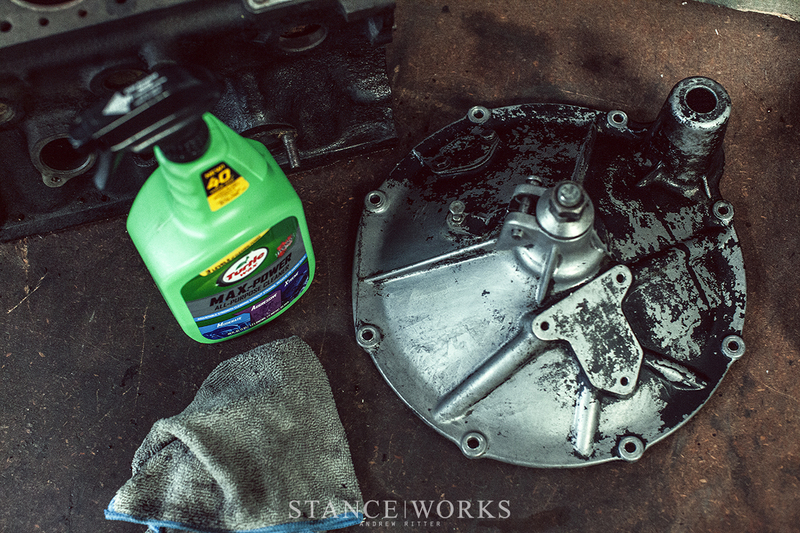 With the oily engine block next in line, I was happy to have such a quick and easy solution on hand. 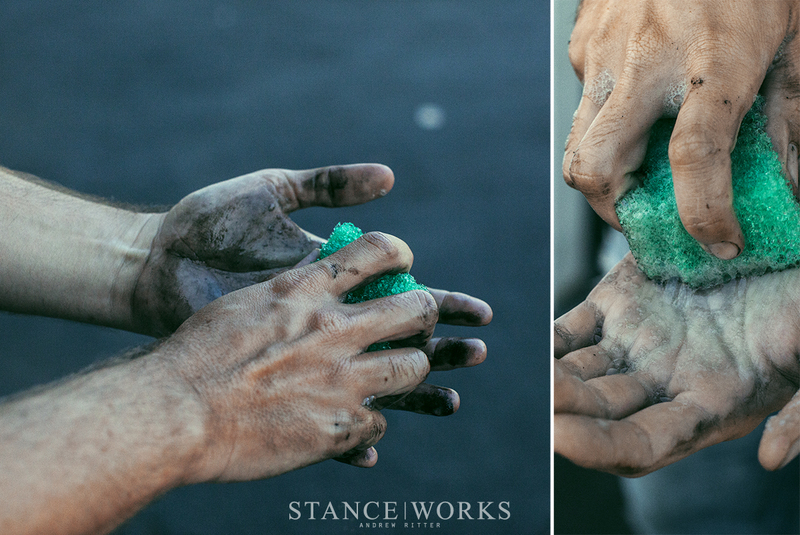 Part of my obsessive nature also lends to me washing my hands what many would probably consider "too often" over the course of a simple day in the shop, but I have always hated the feeling of working with a layer of dirty oil or slippery ATF fluid coating my hands. Often times, I scrub away, disappointed that my routine with various soaps is never quite enough to get it all, but I was genuinely elated to find that the coarse texture of Turtle Wax's M.A.X.-Power Hand Scrubbing Sponge was enough to soothe my nerves. It wiped right through the aftermath of the day's cleaning efforts. I love the act of finding inspiration and the drive that it elicits in us all. Whether found in the pages of old books or on the tarmac of race circuits, the little details of racing's history are what excite me most about classic cars. The past week has reinvigorated me, so while I balance time between the shop and editing photos from the Mini race, I encourage you to find the things that inspire you and then immerse yourself in it. That's where the richness of this hobby exists.